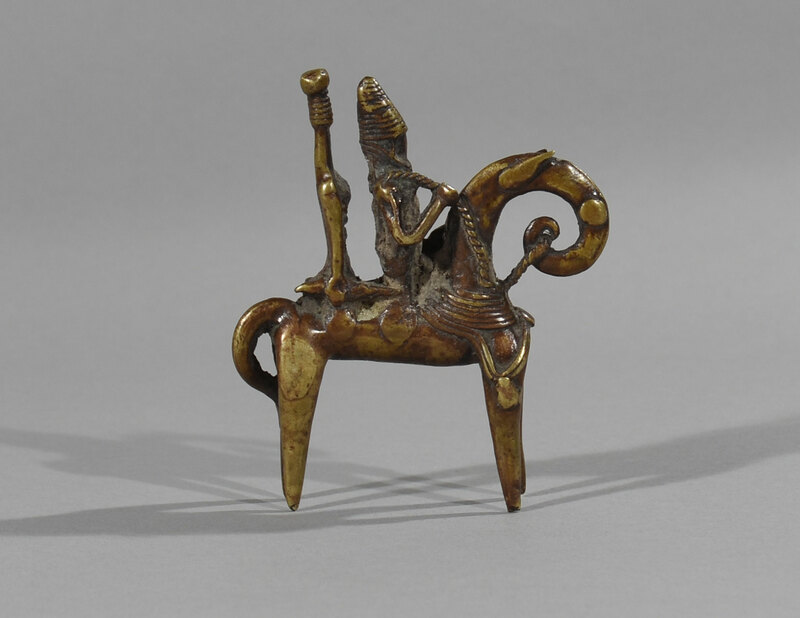 Kotoko Equestrian, bronze figure, Chad (from Lake Chad – Nigeria, Cameroun and Chad). 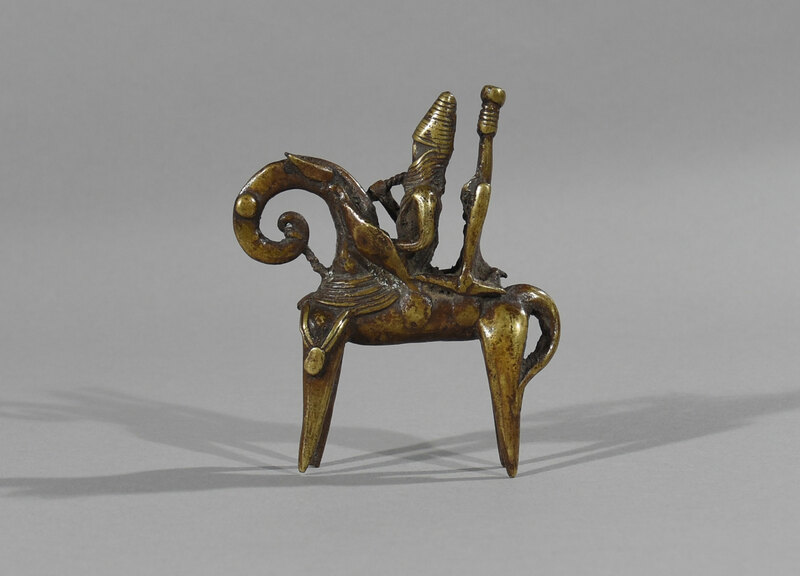 This São/Kotoko Equestrian bronze figure displays two horse riders, which was found in 1950 near the city of N. Djamena, south of Lake Chad near the Cameroon border. 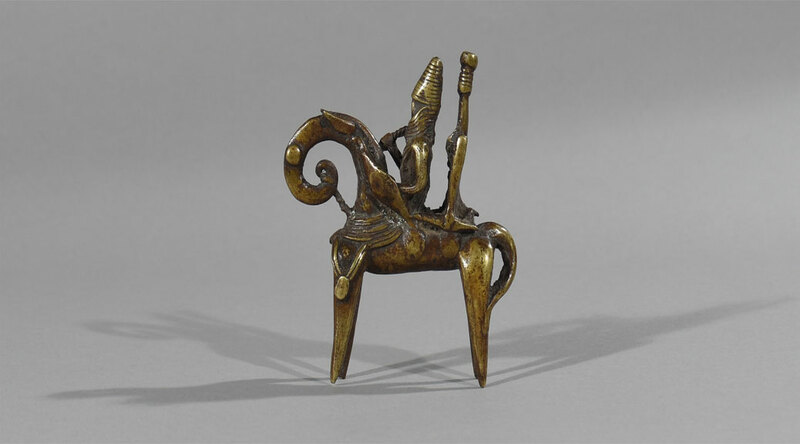 The horse and rider motif is featuring exceptional stylistic versatility and strong symbolic meaning in the culture of the African Kotoko people. 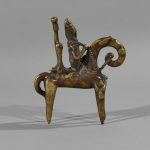 Moreover, the metal cast, which in most cases is the lost wax technique (cire perdue), is a testimony to the exceptional art of sculptural expression of the São/Kotoko people, and their sophisticated techniques of processing material. Age: Est. 15th century or earlier. Condition: Very fine condition and mounted on a customized Black Oak platform. Dimensions: H:12,3 W:11 D:2,5 cm. Literature: Texts adapted from the following sources: J. Olson: “The peoples of Africa”, Joshua Project. The São/Kotoko culture is spread over three provinces: North-western Nigeria, the extreme north of Cameroon and western Chad. These objects seem to come from places of worship inside the mounds emerging from a low plain on the southern shores of Lake Chad. 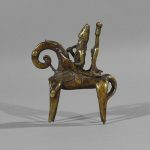 Zoomorphic pieces were produced from the second century BC, but it is especially the twelfth and thirteenth centuries AD. J.-C. as anthropomorphic and zoomorphic sculpture in clay were produced in large numbers, ranging between 1.5 and 35 cm high. These statuettes were accompanied by pieces in copper alloys, small human figures and especially many jewelry, sometimes decorated with small human heads or animal forms. Some human figures are of great styling, such cylindrical busts with perforated eyes in clay and mouth marked by an incision. They are especially distinguished by appendages atop horned head. Other torsos wearing a simple oval head and flat. Another group of sculptures, including both zoomorphic representations highly stylized busts and figurative human figures, is characterized by the eyes formed by a cut sphere with a horizontal slot and incisions rafters. The shaved head is tiny figurative statuettes while lips and chin are prominent. The very short arms they wear crossed straps on the bust and jewelry. Other sculptures are hybrids with a cylindrical body with an animal head. Some heads were isolated, they, face covered with engraved circles.